As Cuthbert served in the Church he became known for being gentle and hospitable even in the face of strong opposition. When the Synod of Whitby finally concluded that the Celtic churches must come into agreement with the Roman way of things it was Cuthbert that helped broker reconciliation by insisting that unity was more important than marginal disagreement. 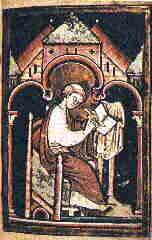 Through hospitality and furious love, Cuthbert was able to me nd the wounds of the Church. Eventually, he became prior of his monastery and he served the Church well by taking care of the monks that he had been entrusted with. At one point he even became a hermit. He lived on an island by himself but was rarely alone due to the constant stream of visitors who came to seek his counsel, blessing, or healing prayers. Cuthbert accepted his visitors with a kind and welcoming heart even as he hoped for a little solitude in which he might worship the God who had called him from a young age to be a servant. Finally, he was called from his island to become bishop and serve the Church by overseeing its monks and ministers. He was reluctant but willing to accept this calling and served in the position capably for many years. At the end of his life a group of monks were sent to the island where he was living to take care of him in his final days. Having known that they were coming, the severely ill Cuthbert had dragged himself down to the beach to greet the men. When asked why he had come so far to greet them he had insisted that he wanted to save them the time and hassle of searching him out since they had never before visited Cuthbert's little island. He finally died after being bishop--a ministry he had been called to from his youth--for only two years. In those years he distributed alms, prayed for the sick and worked many wonders in the surrounding countryside of Lindisfarne. He died on the 20th day of March in the year 687.